Gingivitis is the initial form of periodontal disease. It is a mild form of periodontal disease that causes the gums to swell, become red and bleed. Gingivitis is caused by the build up of dental plaque due to poor oral hygiene. It can also be caused by side effects of medication or poor nutrition. Patients might not experience pain from gingivitis, but they should seek dental care if these symptoms arise. Periodontal diseases (periodontitis) are infections of the tissues supporting the teeth. These tissues include the gums and bone that surround the teeth. 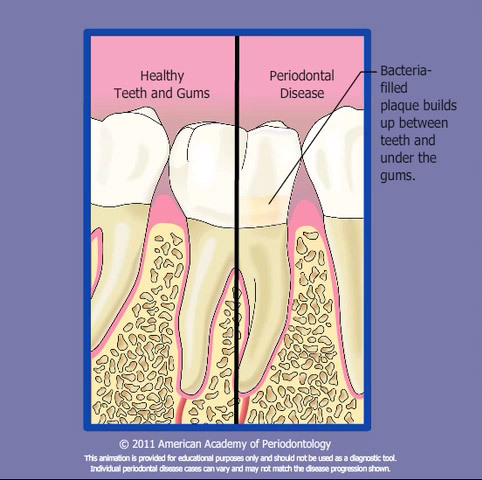 The main cause of periodontal disease is the accumulation of dental plaque. Plaque is a mass of bacteria that adheres to your teeth and tissues in your mouth. Plaque irritates the gums and causes them to bleed, become red, swollen and tender. If not removed, the inflammation of soft tissues worsens and the gums separate from the teeth, causing periodontal pockets to form. Plaque can also become a hard material known as calculus (tarter). Calculus cannot be removed by brushing alone. A periodontist can remove it to stop the disease process. Over time, the tissues that attach the gums to the teeth are destroyed by plaque and it’s by-products. The gums retract from the teeth and pockets form. Plaque and calculus continue to fill these pockets and ultimately the bone that once supported the teeth are destroyed. The upshot is tooth loss. There are additional factors that cause periodontitis. These are smoking, diabetes, stress, medications, grinding teeth, pregnancy, nutrition and immune diseases.